DOLOMIA, low mineral concentration water, springs from the rock of the Eastern Dolomites, today UNESCO World Heritage site, in Val Cimoliana, at 833 meters asl, in the Dolomiti Friulane Natural Park, in an enchanting place with breathtaking scenery of rare beauty and still uncontaminated nature. A protected area, of great geological interest, with a magnificent variety of flora and fauna. Water filtration, the origin of purity. The deepest layers of perennial snows melt on the Cima Preti mountain group at 2450 m a.s.l, causing water to slowly filter through the dolomite rock, forming an uncontaminated, ancient and huge hydrogeological basin underneath the mountain. Water continuously flows into the hydrogeological basin, lying in contact with the dolomite rock for many years, absorbing its most precious minerals and oxygen, then gushing out at 833 m a.s.l. Dolomia is bottled, still flowing, just as it springs from the source, conserving all of its original properties for consumers. Dolomia Water springs at a temperature of 7-8°C from one of Europe’s richest water sources. The place, wild and unspoiled, gives real mountain lovers the opportunity to immerse themselves in the profound silences to be enjoyed during excursions, to contemplate infinity as they marvel at the expanses of the perennial snowfields, at the roaring water of the inaccessible canyons, at the wintry spectacle of the icefalls along impracticable cliffsides. Dolomia was created thanks to the intuition of one of the company’s founding members who, when spending time in Val Cimoliana, was told by the area’s older generation of a time when livestock coming down the valley from high mountain pastures liked to drink – out of the many springs available – at the spring situated at “gote”, where Dolomia Water flows today. It was known that there the water was good. The first analyses gave very positive feedback on the water’s properties and this was the motive that led to the launch of the initiative. Dolomia water flows from the dolomite rock, from which it gets its name. Dolomite rock – specifically Main Dolomite – is particularly widespread in the area in which the Dolomia water source is found and it is one of the main components of the Dolomite Mountains. Its formation dates back to the Late Triassic geological era, in particular to the Noricum and Rhaetian period, 200 million years ago! The Dolomia water source is at the foot of the mountain. 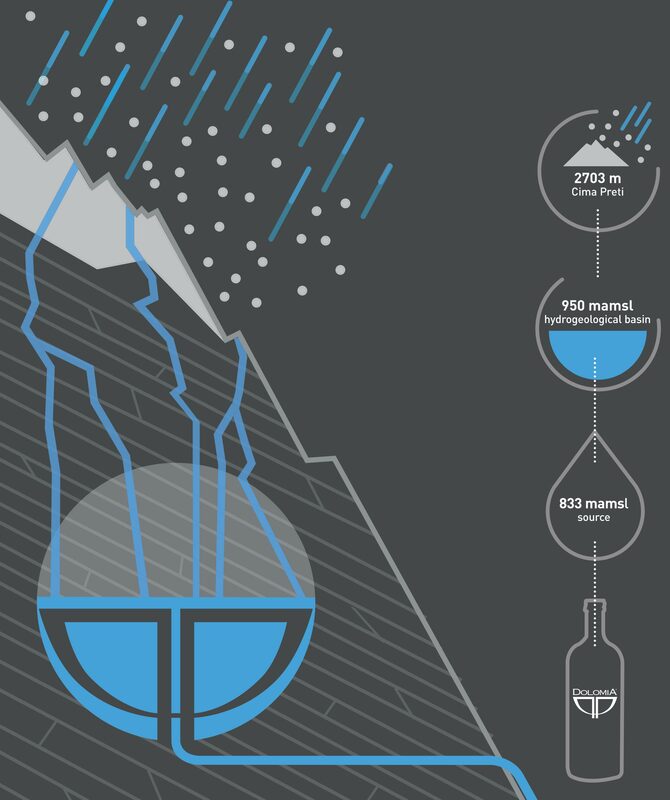 The water comes from a hydrogeological basin underneath the mountain, fed by rain and peak snows, where it slowly permeates the dolomite rock, absorbing not just purity but also the rock’s best components.